1990's Fire Birds is very much a product of its time. It even opens with a quote from George H. W. Bush (in a text scroll) about taking the battle against drug cartels to their doorsteps. It exudes a kill-'em-all-let-God-sort-'em-out sense of American exceptionalism that reigned during the lead up to the first Gulf War (this film opened months before Operation: Desert Shield.) It's all machismo war-games fantasy, with no room for complexity or morality about why America should or could take military action in a foreign land. As such, the plot is pretty thin. As the only surviving chopper pilot from an ambush in Argentina, Preston (Nicolas Cage) is placed on a new task force to take on the mercenary helicopter pilot that keeps the drug cartel safe from prosecution. 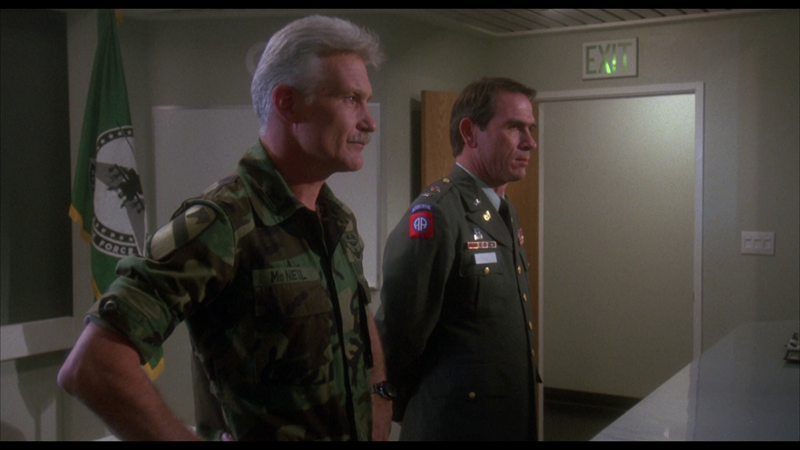 The task force is being taught by one of the military's best pilots, Brad Little (Tommy Lee Jones), to prepare them for air-to-air combat in order to beat the bad guys. 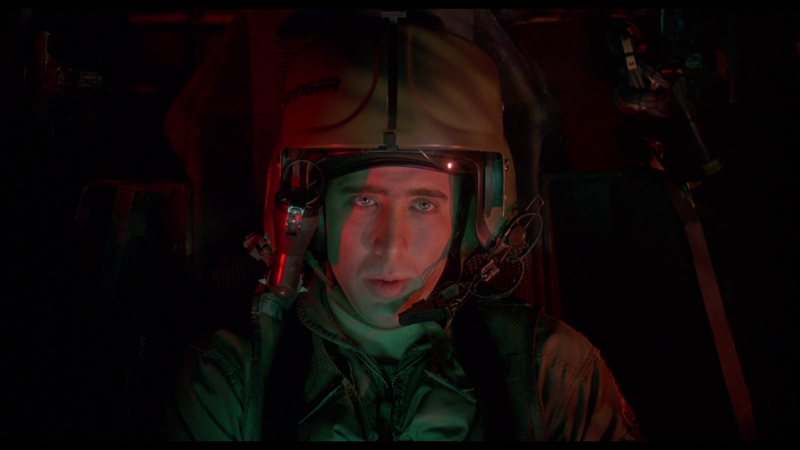 Though Cage is a hotshot pilot, he's got some shortcomings, including an inability to properly utilize the technology in the Army's advanced helicopters, and an awkward relationship with his ex-girlfriend and fellow pilot Billie (Sean Young, in a part so small and meaningless that anyone with a pulse could have played it.) As the older, wiser teacher, it's up to Little to get his charges past their problems and ready for their mission. There are no surprises, no twists (with the possible exception of the ending, which is surprising only in terms of the tone.) The third act is a big, straightforward air battle. There's nothing about the plot that goes any different than you might expect, and that's exactly they way films like these work. Heroes fight bad guys and save the day. If what you're looking for is U.S.A. all the way, this will scratch that itch. It's jingoistic and simple. But that doesn't mean it's all bad. Above anything else, this movie is yet another opportunity to enjoy Cage at an 11 out of 10. This film is an interesting transitional point in Cage's career, following a brilliant run including Peggy Sue Got Married, Raising Arizona, Moonstruck, Vampire's Kiss and Wild at Heart (released the same year as Fire Birds). It would be years before Leaving Las Vegas, as Fire Birds marked the start of a string of questionable choices. But even so, his performance as Preston is a wonder to behold, taking what could be normal action-film dialogue and making it uniquely bizarre. Any time he's in the cockpit, strap in, because you're in for a treat. Opposite him, Jones is perfectly cast as the somewhat past his prime instructor, who is pushed by a sense of duty, a fear of obsolescence and the cockiness of Preston. Every folksy turn of phrase is fun to hear from Jones, who has the gravitas of a veteran soldier, but the whimsy that made his part in the Men in Black franchise so valuable. You couldn't ask for much more in a teacher/student pairing than Cage and Jones. Except maybe a more interesting film to put them in. Kino Lorber brings Fire Birds home on one Blu-ray disc, packed in a standard-width keepcase, with cover art that is a bit odd. It does not seem to be the film's poster art. Instead of the red and yellow poster, this has an oddly cropped and composed montage of the three stars and some helicopters, but Cage is obscured by a pair of sunglasses that he doesn't wear in the movie. It almost looks like something you'd find on a nail-salon bootleg. The disc features a static menu with a more attractive design (but an oddly generic wordmark) that offers options to watch the film, select scenes, check out the bonus features and adjust the set-up. Audio options include English DTS-HD Master Audio 5.1 and 2.0, while subtitles are available in English. It's worth noting that the subtitles often do not match what is said on-screen. Most of the time it doesn't change the intent, but there are plenty of words and phrases left out. Unfortunately, the 1080p, 1.85:1 AVC-encoded transfer on this disc doesn't come from a new master (Kino usually mentions such things on their packaging) so the image comes from a scan at least a few years old, and per all reviews at the time of the previous Blu-ray, released by Mill Creek in 2015, the problems there remain a problem here. Color and contrast are far from exemplary, with blacks often falling in the range of dark gray, and colors feeling a touch muted. The level of fine detail is good, showing off some of the textures and small points in the costumes and vehicles. On the plus side, the film is in fine shape structurally, with no obvious dirt or damage, and there doesn't seem to be any added digital distractions. 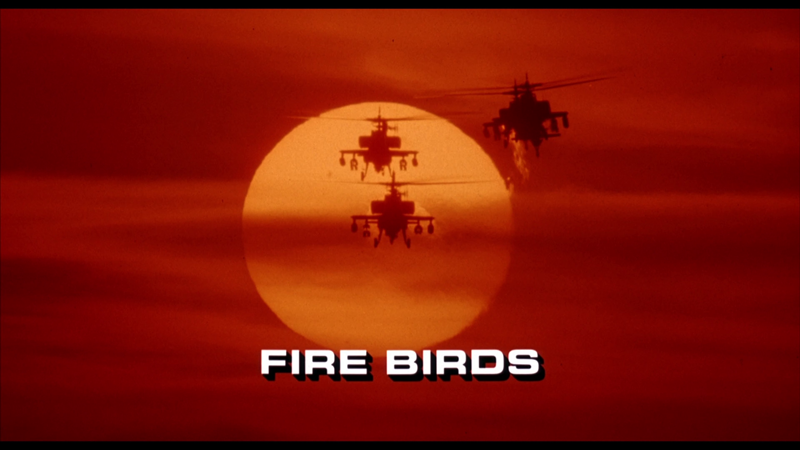 The previous Blu-ray of Fire Birds only had a Dolby Digital 2.0 track, so the DTS-HD Master Audio 5.1 mix here is certainly a step up, and it does a good job of filling out the sound stage, as you would hope for an action film about helicopter battles. Dialogue is crisp and easily understood, no matter the setting, though it is mainly in the center channel, and sound effects are strong, if not particularly positional. The surrounds' main job is to craft the action, using good directionality and movement between the channels to put you in the middle of everything. The LFE is somewhat noticeable, especially when stuff is blowing up, but it offers more of a layer of presence than action-specific impacts. Also on this disc are five trailers, including Fire Birds, Blown Away, The Park is Mine, The Package and One Good Cop. The Fire Birds trailer reveals way too much of the action, while managing to not reveal the storyline. Fire Birds doesn't offer anything particularly interesting from a plot perspective, as it's simply a Bush-era paean to military might and anti-drug crusading, and there's not a lot of depth to it. But it does offer a stage for Cage and Jones to strut their stuff, and that they do, turning in two enjoyable performances that rise above and exist separately from the rest of the film. Kino has delivered the film in decent, if dated shape, though a new audio mix helps, and an audio commentary makes for a package fans of the film will appreciate.